The National African American Archives and Museum in 2008. The National African American Archives and Museum, formerly known as the Davis Avenue Branch of Mobile Public Library, is an archive and history museum located in Mobile, Alabama. It serves as a repository for documents, records, photographs, books, African carvings, furniture, and special collections that relate to the African-American experience in the United States. Some of the collection was developed when the building was part of the Mobile Public Library as the Davis Avenue Branch. The Davis Avenue Branch of the Mobile Public Library was built in 1931 to serve the needs of the local African-American community, as they had been prohibited from using the libraries for whites under the state law of racial segregation. It was designed by architect George Bigelow Rogers. The building was modeled after the Ben May Main Library but constructed on a smaller scale. The local African-American community helped collect used books for the library and raise funds for the acquisition of new books. As was typical in the period of segregation, and since African Americans had been disenfranchised by the state since the turn of the century, their facilities were typically underfunded by cities and the state legislature. African Americans also had to attend separate schools. Following desegregation in the late 1960s after federal civil rights legislation was passed, this branch library became used as a repository for government documents. In 1992 it reopened as the National African American Archives and Museum. It was founded by Delores S. Dees, the organization's first president and executive director. The museum building is listed on the National Register of Historic Places. Exhibits include the History of Colored Carnival, which describes the African-American contributions to Carnival and Mardi Gras celebrations in Mobile and New Orleans. The Slavery Artifacts exhibit features displays of historic shackles, leg irons, slave collars, slave bracelets and slave badges from the slavery centuries. The museum also features artifacts representing the numerous contributions African Americans have made to greater Mobile. They were among the thousands of defense workers in the shipyards during World War II. It chronicles the voyage of the last known illegal slave ship, the Clotilde, which docked in Mobile in 1860. The slaves released from the ship established the community of Africatown. Mobile's African-American community has produced such accomplished figures as baseball legend Hank Aaron and U.S. Labor Secretary Alexis Herman, who both are represented in the museum's collection. The museum also contains a military section, which includes memorabilia of Major general Jerome G. Cooper, the first African American to command a United States Marine Corps infantry company. 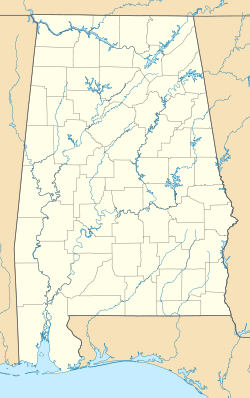 ^ "Alabama: Mobile County". "National Register Historic Places". Retrieved 2007-01-03. ^ a b c "Itineraries: National African-American Archives Museum". "Mobile Bay Convention and Visitors Bureau". Archived from the original on 2008-05-18. Retrieved 2007-12-11. ^ a b c d e "National African-American Archives Museum". "Soul of America". Retrieved 2007-12-11. This page was last edited on 13 February 2018, at 08:28 (UTC).